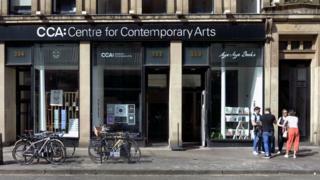 Glasgow's Centre for Contemporary Arts has warned it may not survive after being forced to close for three months. The venue on Sauchiehall Street has remained closed since fire destroyed the nearby Glasgow School of Art. Some residents and businesses returned last month, and the CCA said it was told it could open its doors again on 14 September. But Glasgow City Council denies it ever set a firm timetable, and has said that opening date is now unlikely. Ailsa Nazir, head of operations at CCA, told the BBC Scotland news website that current funds available to the centre may not be enough to support it beyond next month. She said there were concerns for the future of the venue if it was forced to cancel events throughout September. CCA employs 35 people directly and many more freelance technicians and designers beyond that. The centre's cafe-bar - one of 17 businesses that rent out space and which employs 45 people - has also been unable to trade since the fire. Ms Nazir said: "We feel that we've just been forgotten about and ignored because a lot of the issues have been resolved for residents, who are back in their homes, which is good. "But it's as if the conversation has now gone quiet. "We are now in a position where we think we may have to cancel our whole September programme, which is a lot of great arts and cultural activity. "It's not a good position to be in." Ms Nazir said the CCA was "between a rock and a hard place" because it was being denied access to funds on several fronts. Public funding, mainly from Creative Scotland along with some from the city council, accounts for 60% of CCA's activity, the rest is driven by commercial activity. The venue is still waiting for money from the Scottish government's £5m Fire Recovery Fund announced in July. But it appears the fact it already receives public funding may be delaying the process. Ms Nazir said: "Since 16 June we have not been able to generate any income because we've not been open and we've had to cancel events. "And because we have not been able to generate that income we are really getting down to the wire in terms of how much money we have got in the bank." She said: "We are stuck between a rock and a hard place: we haven't had the Fire Recovery Fund money, we can't access our insurance payments, and we are not generating any commercial income because we are closed. We are worried. "Without some sort of intervention ... we don't have the money to last beyond September, October time." The CCA said many artists were already suffering because of its current difficulties. Without the centre, a lot of "weird and wonderful experimental art" would not happen because an open source policy allowed artists to rent space at cost price, Ms Nazir said. The CCA said it had been working to a timetable indicated to it by the council following a meeting of Sauchiehall businesses on 21 August. But this week the council informed businesses still affected by the cordon that this timetable had not been agreed by their officers. A council spokesman said Glasgow School of Art's engineers had told the council on Wednesday that more time was needed to make safe the area around the CCA. The spokesman said: "The council has not, at any time, given a reoccupation date for this area. "The council's priority has always been to get residents and businesses safely back to their properties. "As soon as The Glasgow School of Art makes sufficient progress on site to allow us to identify a safe re-entry date, the remaining displaced businesses will be the first to know."